Rider cards as low as ¢0.01 per card! Get a Return On Investment with only a handful of passengers using your Uber rider code. These Cards are Uber Cool! Our promo cards are printed on thick 16PT card-stock with premium UV coating which gives an outstanding glossy shine. Professional quality print exudes credibility and guaranteed to get your code used to earn you commissions. Diversify your ride-share income with passenger referrals. More Uber money without having to drive! The money from driving can be great, but if you’re looking for ways to earn more through Uber, consider promoting your referral code. Passenger referrals are an awesome way to get another income stream through Uber without having to actually drive, waste gas, and put more wear on your car. 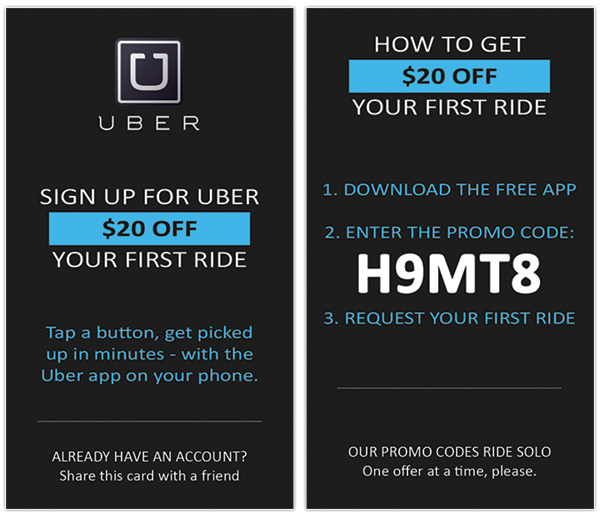 Currently, these referrals are easier than ever to promote since new Uber passengers can get up to $30 off their first ride. That right there should basically sell itself, yet some drivers have trouble capitalizing because they do not have the right tools. All you need is referral cards to hand to people or car magnets for people seeing your car drive by. Here is a design we replicated and printed for Uber Referral Cards denoting the chauffeur’s unique promotional code to get credit for referring new users/passengers to the new taxi / car service. 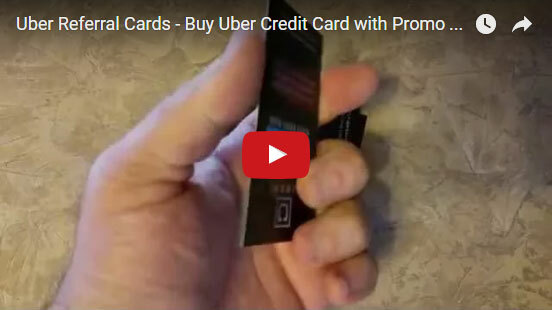 Recruit new drivers to Uber with cards promoting the Sign-Up Bonuses! Now that we established how to diversify income with rider referrals, let’s talk about how increasing the driver network means increasing your bottom line. Uber Driver Recruitment can be very beneficial way to add a third income stream through Uber. Depending on your state, Uber is willing to pay a sign-up bonus to new drivers from $50 – $500! That makes your job even easier to get sign-ups through your driver referral code. That right there should basically sell itself, yet some drivers have trouble capitalizing because they do not have the right tool. All you need is driver referral cards to hand to prospects and leads. 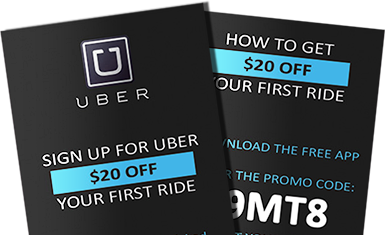 This is the another design option we offer for download and print for Uber Driver Sign-Up Cards denoting the driver’s referral code to get credit for referring new drivers to driver for Uber ride-sharing service. Do you want to get your own business cards? Visit this link to enter your unique referral code and get your cards shipped quickly. Same Day printing & shipping available. After a month of driving for Uber, you will receive an email from the ride-sharing company with title, “Earn MORE CASH with Partner Promo Codes”. We believe this is one of the best way to make extra money. We can print your cards same-day and we also offer same-day shipping. You can hand your passenger the referral card before, during or after the ride, but we strongly recommend handing the passenger the card after the ride is complete, because you don’t want to make your rider uncomfortable and oversell. Just say “hey look, I have some extra cards if you want to give to your friends” or “Share it with your friends, they get their first ride free” as you hand them a couple of cards that conveniently have your referral code prominently displayed in bold fonts. There’s no way they’ll be able to reject the offer as they are evacuating the vehicle. People don’t like things that are too “salesy” and we think that the average person would be put off by the experience if only the “promoter” was getting free credit. Uber’s referral experience is the opposite. No secret kickbacks to get in the way. Just an open, win-win experience for both parties. You get referral credit and the new passenger gets to try out the service for FREE. Trying something new is an expensive proposition. People are creatures of habit and need an incentive to break those habits. An existing alternative to using Uber: a taxi. It’s tried and true, and doesn’t require to risk anything, because it’s known that it works. 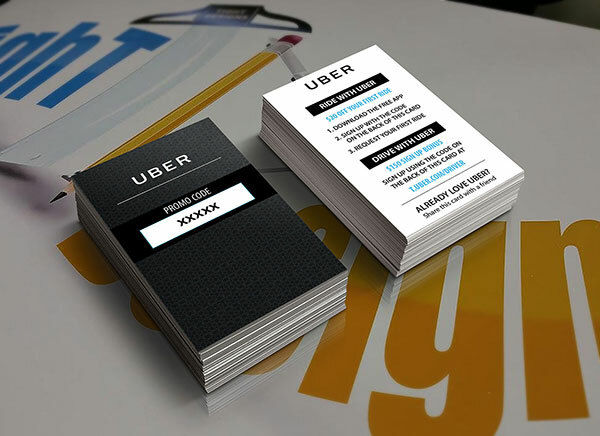 It is no doubt that VistaPrint is the most popular Printing Company on the internet, but how does Tight Designs stack up against it, especially when it comes to Uber Referral Cards? VistaPrint was founded in 1995, while Tight Designs is younger by 8 years it still offers the experience and quality that its customers demand. In fact, Tight Designs starting card-stock is 3 times thicker than VistaPrint’s offering, so while the price may look cheaper in comparison, it actually is not. When you upgrade VistaPrint’s card-stock to match Tight Designs thinnest grade you will see a substantial increase in price and ultimately more expensive. But how could this be if VistaPrint is the bigger company? Tight Designs was created to save entrepreneurs on a ‘tight’ budget money on promotional products without sacrificing quality. This is done by keeping a small overhead, while VistaPrint has a strong presence in Social Media, PPC Ads and TV Commercials, Tight Designs’ marketing is solely done through SEO and word-of-mouth. This translates into savings for our customers. This is why Tight Designs displays their low cost pricing upfront one the very first page of the ordering page, while VistaPrint forces customers to go through a multi-step process to view the price and then up-sell its prospects. The customer feels committed to the sale, because of the time they have invested. Tight Designs’ 1-step process allows customers to place their order quickly and they will never feel pressured in any way. And in the rare case a customer would like to cancel after placing their order it is done instantly. 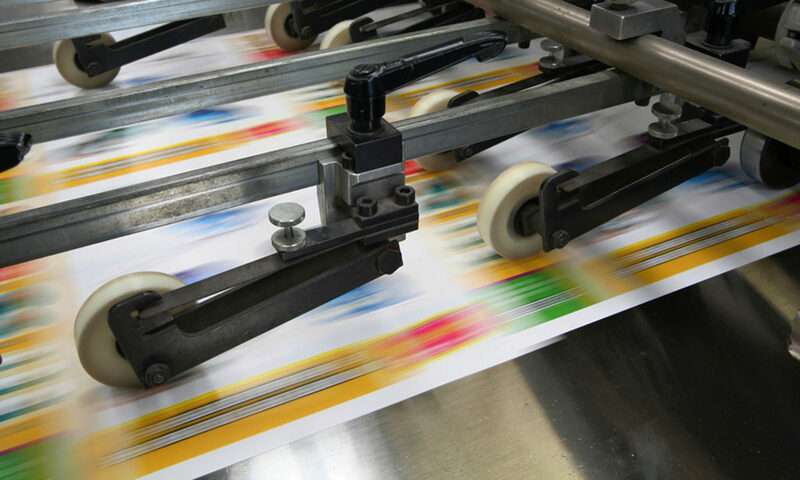 Bottom line, Tight Designs is focused on the customer’s bottom line, offering the highest quality products that VistaPrint can, but at substantially lower prices. Uber is moving as fast as the world & technology do. With their mobile app, Uber connects regular drivers with people looking for a ride. Creating an income for people while offering a cheaper transit option than traditional taxis. Since launching in 2009, Uber has expanded to over 200 cities. Recently, they moved into Florida where they were met with interference by Broward & Miami-Dade county officials. Apart from their like-competition Lyft, Sidecar and Curb; Uber is receiving animosity by local taxi-drivers. But their biggest competition is coming from their biggest investor, Google. Google’s google autonomous car project is heading towards a robo-taxi service taking us one-step closer to science-fiction movies. TightDesigns.com (Perpetual Solutions, Inc.) is not associated with the drive-share service Uber in anyway, but we have so many clients who’ve asked for this service we decided to create this online Uber Card wizard to help streamline the process and lower costs, to turn savings on to the customer. The Uber Logo is a trademark of Uber USA, LLC. TightDesigns & Perpetual Solutions, Inc. is a print shop based out of South Florida, 6151 Miramar Parkway, Miramar, FL 33023. Any questions or concerns in regards to Uber Business Cards purchased through TightDesigns.com should be made to us directly by contacting us at 305.929.3233.